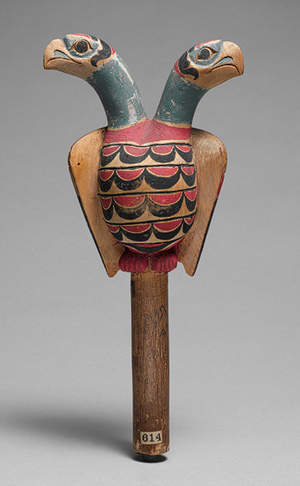 The image above is of a Tlingit rattle, with the motif of a double-headed eagle. With the vast repertoire of supernatural beings who could be invoked in the Northwest Coast art, one could be forgiven for thinking this was another of these figures from the rich mythology and history of the Tlingit people. In fact, this Tlingit rattle is undoubtedly based on the Imperial Russian coat of arms. As I noted yesterday, the Russians were the earliest Europeans into many parts of Alaska. After the Russian-Tlingit Battle of Sitka in 1804, peace talks were conducted and Aleksandr Baranov, the first governor of colonial Russian Alaska and manager of the Russian-America Company, presented the Kiks.adi Sitka Tlingit leaders with a large medallion, on which was found the Russian imperial symbol (below). It was finally decided by the Kiks.adi’s to return and sit down for the peace talks. It was at this peace treaty that the present Castle Hill was given to Baranov in exchange for a double-headed eagle badge, which is depicted on the totem pole [in Totem Square, Sitka]. It was explained to mean, “From now on and forever, we will be brothers. You look one way and we the other way.” The round knob on the bottom of the totem pole represents Castle Hill. The only piece of real estate ever given to the Russians [emphasis in original document]… The double-headed eagle badge, received from the peace talks, is now in the State of Alaska Museum in Juneau [Jacobs 1987:9]. Since that time, the double-headed eagle has been a motif widely used in Tlingit art. I like to think that the Russians did not fully know what they were doing. Early treaties commonly took advantage of very different indigenous views on the nature of property and land ownership in order to dispossess people of their land under the fig leaf of western law. In this case though, I wonder if the shoe is not on the other foot. Crests were inherited rights on much of the Northwest Coast, yet they could also be traded or shared or given away. The right to display a Crest was a valuable property right that helped establish a lineage’s relative status. By acquiring the Crest of the Imperial Russian lineage as compensation for their dead, the Tlingit Chiefs may have in effect subordinated the entire Russian aristocracy: a stunning coup in Tlingit terms. The Russians may never have noticed that they had become Lesser Chiefs in their own colony. Imperial Russian medallion presented by Baranov to Sitka chiefs in 1804. Source: Juneau Empire. The top image is from the small but sweet exhibition of NW Coast musical instruments at the Metropolitan Museum of Art. This entry was posted in alaska, anthropology, history, Northwest Coast and tagged alaska, Baranov, rattles, Russia, Sitka, southeast alaska, tlingit. Bookmark the permalink. This is a wonderful story; thanks for posting it! I bet you have no idea how Mythologies are originated , and you have no idea of Central Asian Shamanistic beliefs and the symbol of Tengri Ulgen “which is double headed eagle” one looks at the east to the Sun and the other looks at the west to the moon . Sumerian city LAGASH symbol of “double Headed Eagle” araound 2454 B.C. nothing more than the extension of Central Asian Shamanistic Mythology . I bet you have no idea about Bering Ice bridge and Migration of People as well as their Mythologies . So did Canadian Indian tribes really learned –very first time just 100 years ago – and their mythological “details” from the Russian Imperial “Double Headed Eagle”? .. I bet you believe everything . The Russian treaty and the “symbol” is just “coincidance” there is no solid archeological proof whatsoever that the Canadian Indians did NOT HAVE DOUBLE EAGLE SYMBOL OR MYTH PRIOR TO THE TREATY WITH RUSSIANS at all ..In fact there are lots of reasons that they should have one . Eagle Totems are all over the place in their at least 8000 years of history ..
Small correction: the Tlingits evacuated their village site after being bombarded by the Russian ship, Neva, and took up residence on Peril Strait, not Peril Straights. Alexander: thanks for the clarification/correction. OMG “Straights” instead of “Straits”: if I had a nickel for every time I have corrected that on an essay I would have at least a buck or two.